Wait. Don’t you still go home every weekend to do laundry and eat all the Oreos in the pantry? Don’t you spend all of winter break sprawled on their couch? The world definitely needs parents, unless you’re planning on paying for your own cookie addiction. Let’s face it. You wouldn’t be the fraternity man you are today without the guidance of those who raised you. No brother’s family situation is exactly the same. That’s the beauty of a fraternity parents weekend. You celebrate them all, whether it’s mom and dad, mom and mom, dad and dad, grandparents, adoptive or foster parents, single parents, or whatever the case may be. By now most brothers are used to their campus independence, and that can translate to some messiness here, some late nights there. Maybe a visit from the rents has you rethinking that Animal House poster of Bluto on your wall. As you may recall, John Belushi’s lovable, beer-swilling brute had a GPA of zero-point-zero. Do you want to spend the whole weekend explaining to dear old dad that your chapter has a minimum GPA and detailing your study schedule? Well, do you, mister? First impressions go a long way on parents weekend, and planning ahead can make a difference in how your fraternity manages. OmegaFi’s here to help you tuck in that shirt and straighten that tie, and for goodness sake run a comb through your hair. Smile. Tell your mother hello. This is how to Manage a Fraternity Parents Weekend. We know you’re good boys, but you have to clean your room, take out the trash and eat all your vegetables if you want to stay out of trouble. Just because you’re twenty years old and living on your own doesn’t mean there aren’t still rules. To prove to your parents that you’re responsible, this weekend will require a lot of planning and preparation. You’re going to want all brothers on the same page. Compare parents weekend to fraternity rush week. You’re trying to make the best impression imaginable. You spend months preparing what to wear, say and do in front of potential new members. Prepare in essentially the same way, except one important difference. During rush week, brothers decide whether to extend bids to wide-eyed freshmen. For parents weekend, brothers are the ones on their heels, trying to earn favor. Sure, your parents love you “no matter what.” That doesn’t mean you shouldn’t bathe. Call an executive board meeting, because you need all hands on deck this weekend. Once you cobble together an effective strategy, bring your ideas to the brotherhood during chapter meetings. Strategize and coordinate to make parents weekend a success for your fraternity. Plan a presidential address to parents, touching on topics like chapter GPA, fraternity values/ethics, as well as past and current philanthropy and community projects. Give a house tour and Q&A. Provide brothers with guidelines for attire, etiquette and roles throughout the weekend. Detail tasks to be completed before parents arrive, i.e. cleaning, decorations, food, sports tickets and any other final prep work. Send official invitations to parents and compile a guest list, including younger siblings. Pay special attention to new brothers’ parents. Plan to reassure them of how your chapter tackles common concerns like hazing, partying, grades, how dues are budgeted, etc. Prepare fun activities for youngsters. Ask sorority sisters to volunteer to help with some of these activities, in exchange for brothers’ volunteering during one of their upcoming events. Ask an alumnus or two to attend and mingle with parents. They can provide an official perspective. Create a loose schedule of events, but keep it casual, and be prepared for changes. Where’d You Put That Broom Again? When parents are coming to visit, leave your fraternity house manager flabbergasted by actually cleaning. He’s been telling you for weeks to do a little sweeping. He’ll be more than elated that parents are putting that fear into brothers and helping them suddenly remember they are in fact men and not barnyard animals. Clean the fraternity house from top to bottom, and yes, that includes brothers’ rooms. “Show me where you live” will be the first thing out of every parent’s mouth. Count on it. While you’re scrubbing toilets and dueling raccoon-sized spiders--and possibly a raccoon or two--just remember all your parents have done for you over the years. Remember how much trouble you’ve given them. Now’s the time to pay them back. While you should prepare for parents weekend, one major difference from rush week is that your schedule shouldn’t be as rigid. Parents won’t want to feel like you’re herding them from activity to activity. Some have had long flights, they’re tired, hungry, and they just want to spend time with their sons. Try to keep the weekend as laid back as possible, keying in on a few main events. These can be simple things, like taking the dads to a football game or having a special dinner to honor moms. Barbeques in the university park can also provide a chill experience. Whatever you choose to do, stay away from loud music, dancing, or other activities that are too up-tempo. In other words, don’t do what you normally do. Provide environments where spending time together and communication are the main ingredients. When parents come to town, it doesn’t have to end in pulled ears and being sent to bed without dinner. 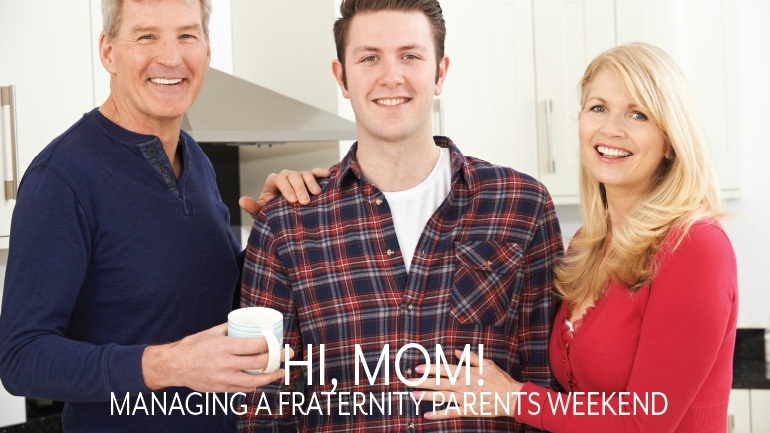 With a little elbow grease, planning and putting your best foot forward, your chapter is sure to have an engaging and well-managed fraternity parents weekend. Send the folks home smiling and assured their sons are bettering themselves as men in the classroom and the chapter room. If your chapter has held a parents weekend in the past, what’s worked for you? If you’re planning an upcoming weekend, what concerns do you have? Give us your laundry list in the comments below.